During a break in shooting on the 11th, the action was captured on a home movie camera as the group had fun on the Astor mansion grounds running relay races; with the Beatles on one team and members of the film crew on the other. In the end the Beatles' team claimed victory. During this break in the filming, Houston Disc Jockey Buddy McGregor spent time chatting casually with the Beatles. Q: "Quite a race was run on the lawn here at the Astor mansion today, and the Beatles did win, as I told you earlier. 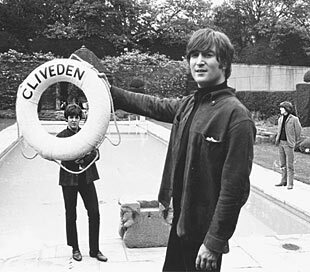 And I have Paul and John here. You ran a very good race." PAUL: "Thank you very much. Thank you." Q: "Had you ever done this before?" PAUL: "Not since school, you know. Done a bit since... I haven't done any since, I mean. I've done some now, you know." Q: "This was quite a long course out there." PAUL: "Well, yes. Fifteen furlongs, I'd say." Q: "There was a lot of good running back there. Do you think you did your share?" PAUL: "Well you see, the best team won." Q: "John, do you have any comments?" Q: "Thank you. John, Americans aren't..."
Q: "...aren't acquainted with the term 'spanner.' It's a wrench, isn't it?" JOHN: "Wrench, monkey wrench. Yeah." Q: "And so your new book called 'Spaniard In The Works' is really a play on the word 'spanner.'" JOHN: "Yes. We're playing about with spanners. (laughs) Just me laughing." Q: "Does it have anything to do with a monkey wrench?" JOHN: "No. It's just about a fella. There's just a drawing of him with cars, you see. It's nothing about cars. He's a Spaniard working on a farm." Q: "Oh. We call these popsicles at home." JOHN: "We call them, uhh... what do we call them? ...Lolly ices." PAUL: "Lolly ices. I was gonna say icicles, but we don't." JOHN: "We call some of them Jerry." Q: "Yours is red and his is yellow, and Ringo's is yellow." RINGO: "Guess whose one's got the bellow." Q: "Ringo just joined our little group. Good seeing you. I wanted to ask about your car, Ringo. It's a beautiful thing. What's it called?" RINGO: "It's called Nigel. It's called a Facel Vega, actually." Q: "Doesn't it have a Chevrolet engine?" RINGO: "I don't know. It's got an American engine whose name I will not say... unless they give me a free engine." JOHN: "Yeah, I'll mention it too if you give me a free engine." Q: "John, the rocks that you and Paul got from our trip this morning. We went down to..."
JOHN: "It was me and George that got the rocks." Q: "Oh I'm sorry. It was George." JOHN: "Paul's already got rocks... in his head." Q: "We went down to the pub at lunchtime and there were some little bushes and hedges around the front of the pub and what do you think surrounded them?" JOHN: "I dunno. More little bushes and hedges?" Q: "No. All those rare rocks that we thought we had a scoop on." JOHN: "Oh that's lousy. What happened? Maybe somebody else had been down there plucking them." Q: "They're all over the place up at the pub. Are you looking forward to this (American Tour) trip?" RINGO: "Can't wait to get to Houston, man." JOHN: "Yeah. Let's go to Houston." Q: "John, have you heard about our Astrodome?" PAUL: "Yeah, I have. It was on the Early Bird link the other day on the television." PAUL: "And it said, 'Howdy Europe, Yeah!'" JOHN: "Oh, was that it?" JOHN: "Oh it was great, that." Q: "And the scoreboard lit up and said 'Howdy.' When they hit a home run, it goes crazy. It flashes lights and does all sorts of tricks." PAUL: "It has a mind of its own." Q: "Pretty much. Pretty much." Q: "The Beatles are eating... lollysicles. Is that right?" Q: "Which is what we refer to as popsicles in America." RINGO: "Do you? Why? 'Cuz they're made of ice." Q: "I really don't know why we call them popsicles." JOHN: "I mean, they're not made out of POPSICS, are they?" PAUL: "Lemonade pop, made into an icicle. Pop, sicle." RINGO: "Well that's figured that out then... Well, why is it lolly ice? 'Cuz it's lolly with ice. And it's lolly ice." RINGO: "You don't know what a lolly is? Everybody knows what a lolly is." JOHN: "Well, we've made the LP then. Shall we go?"